Figure Skating - 11. February 2019. 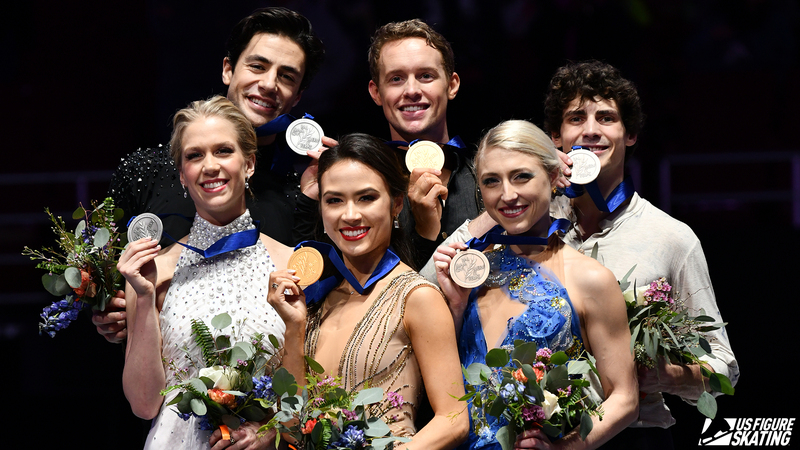 Madison Chock and Evan Bates won their first Four Continents title Sunday afternoon at the International Skating Union (ISU) Four Continents Figure Skating Championships 2019. The Montreal-based team received a Level 4 on all but one element in their Michael Buble and Elvis Presley free dance to earn a segment score of 126.25. In their third competition in five weeks for their comeback after Chock’s 10-month recovery from ankle surgery, they topped the podium with 207.42 points. Both scores are the highest internationally by an American team under the new judging system. The win marks Chock and Bates’ fifth Four Continents medal in as many trips to the event. Two-time and reigning U.S. champions Madison Hubbell and Zachary Donohue finished fourth with 119.71 points for their Romeo and Juliet free dance. The team, who led after the rhythm dance, received the highest program component marks of the day with 57.21. After receiving a base level for their opening stationary lift, Hubbell and Donohue landed less than a point off the podium with 201.66 points overall. Kaitlin Hawayek and Jean-Luc Baker set new season’s best scores en route to a fifth-place finish on the final day of the event. With four Level 4 elements and all positive Grades of Execution, the 2019 U.S. bronze medalists tallied a segment score of 115.45 points for their performance to music by The Irrepressibles. They finished the competition with a total score of 189.87. Canadian ice dance teams Kaitlyn Weaver and Andrew Poje and Piper Gilles and Paul Poirier finished second with 203.93 and third with 202.45, respectively. The free dance marks the end of competition at the ISU Four Continents Championships. All three teams, coached by Patrice Lauzon, Marie-France Dubreuil and Romain Haguenauer in Montreal, are slated to compete next at the 2019 ISU World Championships next month.